While pet owners might think of February as National Pet Dental Health Awareness Month, this title doesn’t really address those of us who have birds. Now, birds do have an “egg tooth” briefly, which they use to hatch out of the egg, but perhaps birds need their own slogan: National Responsible Pet Owners Month! There are important clues in that statement. The first is … “I took it to a vet.” This sounds like this person thinks that all vets are created equal, at least when it comes to knowledge about birds. That is far from the truth. Bird or avian veterinary medicine is not an integral part of the standard curriculum at any of our four-year veterinary schools. They may provide an introduction to avian medicine and some schools might even give students some hands-on experience; however, as I used to say when I taught avian medicine at The University of Tennessee, you learn enough to be dangerous! What does that mean? It means that the veterinary student is provided with a basic understanding of a small part of avian medicine. That could be enough to get started in lifesaving measures, but not enough to diagnose and treat many of the conditions of companion parrots. That takes more training – like a one-year internship piled on top of a two- to three-year residency working under a skilled, board-certified avian veterinarian in an approved residency program. Veterinarians who are board certified have taken the time – at least four years along with written reports, and two days of intense testing – to master parts of avian medicine. The process involves mountains of work and dedication. Yet, even after that, there is always more to know. You might know a lot about Amazons and macaws but may have limited knowledge about kookaburras or Anna’s hummingbirds. How Vetted is Your Vet? Veterinarians can say they “see” birds, as anyone graduating from vet school can legally say, even with limited understanding of birds and their care. They may develop their skills and knowledge over time, but they currently have limited expertise. The next rung of the ladder holds those veterinarians who list that they are members of the Association of Avian Veterinarians (AAV). These individuals have the potential to learn current therapies and techniques; but still, the questions that matter are, “When did he or she last attend the annual conference?” and “How many conferences has he or she attended in the past?” The AAV Conference provides cutting-edge information, but only if one is there to learn it. A higher rung holds those who say that their practice is limited to birds, for these veterinarians have considerable experience with birds. Those who are board-certified have gone even further down the road of education to get certification, and they have also attended conferences and done a variety of continual learning courses to be re-certified. All of this takes considerable time, effort and money and part of that expenditure is why the examination charge from a board-certified avian vet is often higher than what a general practice dog and cat veterinarian would charge. This is for a good reason, as my old friend Liz Wilson would say! That boarded person has more expertise, and should be comparably priced to other board-certified veterinarians, yet the office call is often less. So What Is a Responsible Bird Owner to Do If their Bird Is Sick? Unfortunately, many people forgo taking their bird to the vet until it is too late, as in, “Now I should take my bird to the vet because it is down on the bottom of the cage.” When a bird is that sick, it is very difficult (for anyone, no matter their knowledge or expertise) to bring the bird back from the brink of death. That is often the case when a bird is so weak it is unable to leave the cage floor. At this point, all of the bird’s body’s resources have been used up trying to appear normal to the flock, and the bird can no longer support himself. In the wild, obviously sick birds could be driven from the flock or be selected for attack by a predator. So, sick birds tend to disguise their illness until they are no longer able to do so. When birds get sick, they often sit lower on the perch; spend more time ruffled than they do during their normal afternoon nap time, and tuck their heads and sleep more. The quality and color of the feathers reflect the overall health of the bird. Birds that are fluffed and ruffled, and those with wet, stained, or matted feathers (particularly over the cere or nostrils), should also be examined. Examine the contour or shape of the head, beak, nares or nostrils and the surrounding feathers for any changes. A bird that does not feel well may stop singing, talking or whistling. An ill bird may not be willing to interact with people. Lime green-colored feces suggest liver disease. Matting of the feathers around the vent from sticky droppings is abnormal. Blood tinged droppings are abnormal, indicating the bird needs medical attention. Large droppings in female birds often result from impending egg laying but may also be from an infection. Smaller and/or fewer droppings indicate that the bird has reduced its food consumption, often because of illness. Daily observations of the amount of food consumed, quantity of water drunk, and number, consistency and odor of droppings are important in assessing each bird’s health. Any changes from normal indicate a potential problem that should be evaluated further. Problems with the legs and/or feet alter the posture and stance. 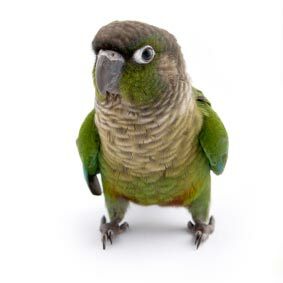 Birds that stand consistently on one leg need to be examined. Keep your eye on your bird while you interact and play with it. Pay attention to the sometimes subtle changes listed above, and you can give your bird a fighting chance if it should become sick. If it is, take your bird to your avian veterinarian. Remember to give your bird a yearly checkup, just like your dog and cat, and have periodic grooming as needed. Your vet can use these times to evaluate your bird’s health and intervene if needed. Since February is also Valentine’s Day, treat your bird to a time to make sure it is healthy, for the love of your bird!